Welcome to New England Specialty Foods! There's never been a complete listing of all the various small and medium specialty food producers of New England, until now. We thought it was time for one, since the way the major search engines like Google function, you would probably never find most of them, and if you like dining on the finest artisan foods, that would be a real shame. There are more than a thousand small and medium producers listed in the Directory on this page, with frequent updates. This website is the first of eight regional websites of America's Specialty Foods. Our ultimate goal is to have all specialty food producers of the USA listed on America's Specialty Foods, for the greater good of all, as a virtual industry cluster. Several specific ideas to hopefully make life a little easier for small producers are mentioned throughout this website. If you know of any business which should added, just email it to us. There is no charge to be listed in the New England Specialty Foods Directory. Listings, as well as all services, are always 100% FREE. Why not make a suggestion to the manager of your favorite chain supermarket that they waive slotting fees for small, local producers, to give these businesses a chance to grow, creating jobs and helping the economycome back stronger? This New England Specialty Foods website also has a growing Resources Guide, with a unique assortment of all the products and services needed by small artisan food producers. A sister website, Specialty Foods Best Resources, has a more in depth approach at displaying top vendors in all categories. One of the primary goals of New England Specialty Foods, as well as America's Specialty Foods, is to make it easy to find high quality, reliable resources, when they are needed. As time passes, one of our visions is that this Resources Guide becomes the Angie's List / AAA ratings resource of our industry. If you have any comments regarding anyone on our lists, or would like to recommend a​ supplier for our directories, just email us. If you'd like to rate a supplier, there is a Confidential Ratings Form, similar to Angie's List, on our Specialty Food's Best Resources website which you can complete for as many suppliers as you'd like. If you believe other producers would be better off knowing your experiences, either good or bad, with specific suppliers of products or services to the specialty foods trade, please take the time to document your experiences. It has worked very well for consumers using Angie's List since 1996, and can be an invaluable resource for you, as others start to rate their specialty foods business experiences. Or, if you prefer, you can just email us your ratings thoughts for a supplier in a paragraph in your own words. with more than a decade of trial and error discoveries about what to do and what NOT to do, to greatly increase the odds of making a profit creating and selling your own specialty foods products. Much has been written about getting started in the specialty food business. 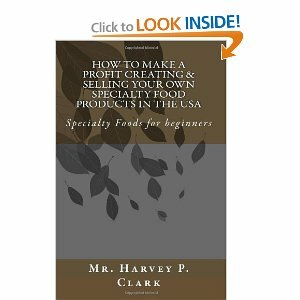 My name is Harvey Clark, and I've been creating and selling my own specialty food products in the USA since 2002, and have never seen a book or website which came close to telling you everything you need to know to make a profit doing this. ​It's available on Amazon.com. Just click on the picture of the book to preview it! Like to go shopping for artisan foods? Just published! a brand new Second Edition! If you find any broken links, please Contact Us so we can fix them. Thank you! ​ Unique New Ways to Market Your Products, FREE! There have always been numerous possibilities for marketing the specialty foods products of America. You can think of the marketing ideas listed on this website as experiments to find out what might be accomplished by uniting the overall potential impact of communications from virtually all specialty foods producers in the USA. It doesn't matter if you just starting out an artisan food business, or have been at it a while, but with less than ideal results. This plan is designed for everyone. We've tried to create a scenario with no cost & no risk, to which no one can possibly say 'no' to. The goal here is to be Specialty Food's Best Resource. The first group of marketing ideas are explained on the next page. If you choose to give this a try, just complete the brief contact form at the bottom of the next page, and click on the "SUBMIT" button below it. Once your specialty foods business is included in our database, your business will be included in all of our marketing activities listed below, & you will receive regular updates as to which marketing experiments are in progress. That's all there is to it! A New Way to Market Your Products !